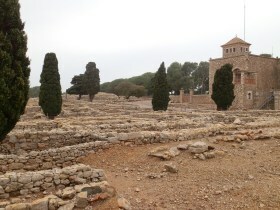 Situated just north of L'Escala, right on the coast itself are the ancient remains of the Greek and Roman towns of Empuries, the major port of the Costa Brava coast in the Ancient world, and along with Barcelona and Tarragona, one of the main Catalan Roman cities. We'd seen the ruins from the sea-facing side walking between L'Escala and Sant Marti d'Empuries - a very pleasant Sunday afternoon stroll. What we hadn't realised until this year was the extent of the ruins on the other side. Only when we were returning from Cinc Claus on the walk from Escala, St Marti d'Empuries and beyond did we really start to get an impression of the size of the site. The whole site has now been dedicated as an archeological site with a modern museum with entrance only €3 for adults and free for children and we were allowed to take in our dog on a lead. What's initially surprising is that Empuries actually consists of two distinct towns. Prior to visiting I was under the impression that the Greeks came first and then their village was taken over by the Romans. In fact the Roman Empuries is distinctly separate from the older Greek part. The history of the site is that it was first created as an outpost of the Phoenician's and then became a Greek colony and port trading inland with the neighbouring Iber tribes and villages (Empuries and Emporium as a shop share the same derivation). The Greek's travelled throughout the Mediterranean and had colonies in places like Sicily (Syrakuse). The Greek ruins run up the hill and there is a temptation to imagine a white walled village like Mykanos on the side of the Catalan Coast. For this visit though, we visited the Roman part first. This is marked by a long straight wall of about 300m in length, and surprisingly the wall is hollow - there would have been enough space for someone to walk through the middle. On the outside of the wall was the ampitheatre and stadium training ground, while the remaining parts of the town stood inside the walls. The Roman town itself was built within a rectangle with straight streets in a modern block arrangement. Entering through the gate on the main wall, you walk down what would have been a main street where there would have been shops and traders. The stone flaggons on the floor still show the ruts from carts that would have passed through. At the end of this street is the main forum - the main town square. To help visitors, part of some of the buildings have been rebuilt and stone columns re-erected to give a sense of the town. Past the forum are the remains of the ancient baths and what would have been two or three large villas. Although many of the ruins have been excavated but there is still a large area to be explored. We then walked down the hill to the start of the Greek village built 500 years before the Romans arrived. While the Roman part was laid out in a regular fashion, the Greek city is much more higgedly piggedly with houses and spaces seemingly on top of each other. I always find it difficult to construct an image of a town or buildings just from their foundations, but even so it's very clear how large the town would have been. 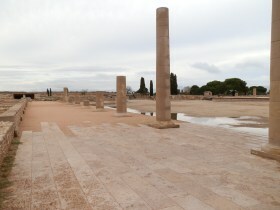 The Greek part also had it's own square and temple and area dedicated as a 'health resort'. The main Greek walls are at the bottom of the hill. The site also has a modern museum where you can see artifacts. If anything we were slightly surprised at how little there was in the museum given the size of the main site. 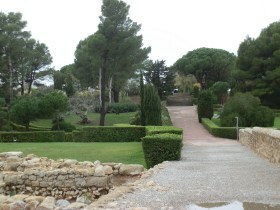 It is possible that much of the town was plundered when it was abandoned for Sant Marti in the early post-Roman era. The geography of the site is also interesting in that when the Greeks and Romans were living in Empuries, the sea was a lot farther inshore. The ancient port wall that can be seen on the beach below Empuries would have protected a harbour inside the wall, where the beach is now (suggesting a sea level 3-4m higher than it is at present). 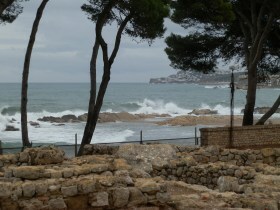 In fact the sea was sufficiently high that neighbouring Sant Marti was an off-shore island at the time. Changes to sea-level combined with silting and shifting of the river Fluvia essentially rendered Empuries obsolete as a port, but it is interesting that there are so many Roman ports on the Mediterranean (eg Ephesus, Portus, Carthage, Frejus) which are now dry or a long way from the sea.